Today ought to be my last day on ADSL, as tomorrow is switchover day to Vodafone FTTC (40/10)! I feel a bit like I'm about to go down a giant water-slide I've never seen before: I'm (reasonably) confident I'll make it through OK, but I have no idea what twists & turns I'll encounter along the way. My MDWS stats will be offline for a while, until I can either figure out how to get the figures from the supplied HHG2500, or I get my VF username & password to re-instate the DGA4130 I'm currently using. Good luck with the switchover. You won't be able to get DSLstats working with the HHG2500, and it's generally considered to be a poor performer, so your best option is to get your login credentials from Vodaphone and revert to using your DGA4130. 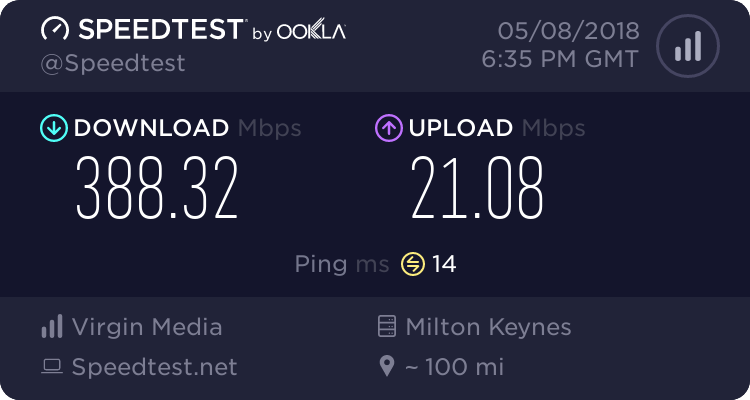 FTTC is just now up & working: real speeds now 33.0/9.1 (was 6.8/0.3 on ADSL). Still using VF router, but I have my username & password so will look to change to DGA4130 later tonight - when others are not trying to use the internet. I use an unlocked DGA4130, so if you need any help with configuration, let me know. Actually all I had to do was enter the ISP username and password and it worked. Other second order things could be configured later if needed. On ADSL I was running f/w 1.03 & GUI 3.9, but when I took it offline earlier today I couldn't see how to enable Vlan. I took it back to the standard TIM gui and Vlan was back. Unfortunately I had forgotten the steps I took to re-enable Ansuel's gui, so have had to wait for the Internet to come back online so I could look up the steps again. Well, I seem to have made it to the bottom of the slide without major mishap. Now using the DGA4130, and uploading to MDWS. There was a small problem with the Vodafone DNS servers not giving me internet access, but I have changed to using Google's, all is well. All I need to do now is make some sense of the numbers. The real download speed has increased by 3Mbps since changing the router, so I'm glad I did that. Glad to hear that your ADSL/VDSL migration all went to plan, well done on your part, you are certainly getting into this technology very quickly, obviously a natural. Early days yet for MDWS stat's analysis but your line appears to have synch'ed exceptionally well, practically on your 40/10 provision rates, is the fibre cab. outside your door or in your garden ? US ES's increasing to expectation but still very low, should be practically eliminated when DS G.Inp is eventually applied, that's up to DLM when that occurs, as you have likely read on various forum posts, can be up to 8 weeks, a few members reporting even longer, mine took just over 7 weeks after ADSL/VDSL migration with Plusnet. Have you noticed that vectoring is indicating "fully enabled", looks like you are one of the very lucky few. Both DS & US SNRM's are very high, I would have thought that's because your line is already on DS/US target synch rates and lower target SNRM's are not required, I'am sure some of the more knowledgable forum members can give you a much more accurate explanation on this, I'am only guessing. Don't really know what effect vectoring will have on this, only a few MDWS users have vectoring to date. Have you checked your BTw BRAS IP profile's yet ? I'd be interested to know your line length. I'll wait a while then before I try any update changes on the DGA4130! I've tried, but from my old PC it didn't work. I'll try again from another machine tomorrow. I'll try to get that tomorrow, and post back. That's a very nice attainable speed 120/33, you could get the full fat 80/20 without any issues. Vectoring basically counter acts crosstalk, crosstalk is interference from ones persons line to another and can knock 10's of Mb's off sync speeds. I believe Kitz used to have an attainable speed like yours, but she's now down to 73Mbps due to cross talk. Don't use Firefox browser when running BTw Performance Tester, known speed reporting issues although the BRAS IP profile should still report accurately. Quite impressive statistics, viewed via MDWS. One anomaly is that MDWS is still showing the Hlog and QLN plots from your prior ADSL2+ service. In due course they will change to the current plots for the VDSL2 service.